This dramatic barn wedding photograph was taken just after sunset on the wedding day. The wedding ceremony had already taken place and a casual cocktail hour was held outside as the sun set. The bride and groom and all of their friends and family had taken their places at the elegant dining tables set up within the barn on this private 14 acre estate. Just after sunset the beautiful colors of the setting sun began to reflect in the clouds of the evening sky. The landscape lighting came on and the scene took on such a beautiful look. I set up my camera and lights, did a couple of quick test shots and then summoned the bride and groom to come outside for this amazing photograph. It took up but a single minute of their time to execute but they will have this photograph to treasure for the rest of their lives. 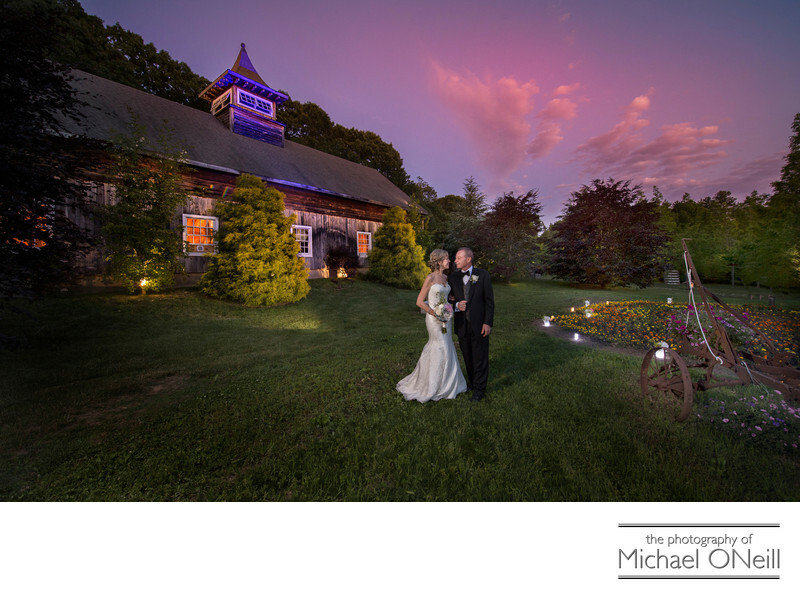 A barn wedding, whether on a private estate like this one, or at one of the many Long Island east end wineries or vineyards, can be the perfect venue for a truly unique casual, rustic or elegant wedding theme. Barn weddings pose their own special challenges for the photographer and the other vendors who will be at your service on the big day. Choose your people carefully as they are to be entrusted with making your event run smoothly and professionally; and to insure that you will have lasting, beautiful memories of your big day.